Osfoora for Twitter is a fast and clean twitter client that gives you easy access to all of twitter’s functionalities. Osfoora features an elegant and clean Home screen that lets you access most functionalities in a single touch. With an elegant user interface, multiple account support, optional full landscape mode (customizable), and more, using twitter becomes a joy! 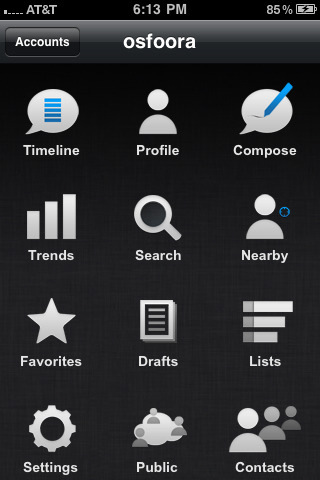 ★ Easily explore and manage your twitter timeline, mentions, messages, favorites, lists, and more. ★ Full Trends support, recent trends, today’s trends, this week’s trends! ★ Upload photos with yfrog and Posterous. ★ Upload videos to yfrog and Posterous.